Are you a Game of Thrones fan looking for a Game of Thrones chess set based on the epic novel and TV series? I have a good news and a bad news. Even though the first book of the series was released almost 19 years ago back in 1996, it was only in 2011 when the book was turned into the TV series named “Game of Thrones” that the whole world of ASOIAF really came into the limelight. 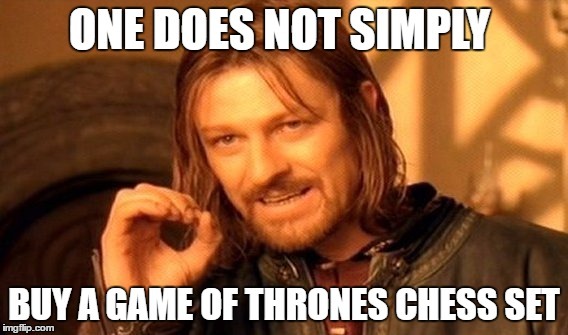 Simply put, to date, there has not been a single chess set made on the GOT theme that I can really recommend. The ones that are available (if any) look more like cheap, plastic, and just plain bad attempts at making a themed chess set. One major possible reason for this that makes sense to me is that the Game of Thrones world is so big, with so many major characters that it would be almost impossible to put them all on a chess board. Think about it. Who would you choose as the King? Who should be the Queen? Bishop? Rook? You get the idea. With six different houses all trying to take over Westeros, it would be impossible to select just two armies for a Game of Thrones chess game. For a chess game to be enjoyable – even if you are not following all the rules of a serious game – there have to be two and only two opposing armies. This is not the case with Game of Thrones which has five or six major houses fighting each other as well as the looming threat of the white walkers from across the wall. The TV show gave the characters of the book a ‘face’ which led to worldwide recognition of its actors and everything that comes with it: memes, pop culture references, fan art, memorabilia, collectibles, action figures and so on. As sad as it is that there is no Game of Thrones chess set available in the market right now, there is a really, really good ‘alternative’ in the form of a board game. 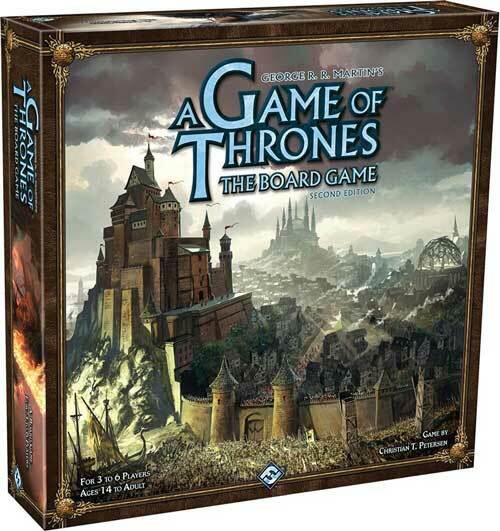 If you are a fan of board games and Game of Thrones, this is THE board game you should get your hands on. Hell, even if you are like me and have never really forayed into board games as a kid (I was always playing chess) you will still get a ton of fun out of this board game. Just gather 4 or 5 friends and you are on your way to 3 to 4 hours of intriguing gameplay. The game can be played with just three players as well but it’s more fun if you have six – one controlling each of the great houses of Westeros. The board game comes packed with detailed rules and instruction videos on the manufacturer’s website. Each player starts with an army and deck of unique house cards that represent the leaders of their respective house. There is a total of ten rounds in which the players scheme, fight, negotiate or betray their way to take hold of the areas with the most castles and or strongholds. 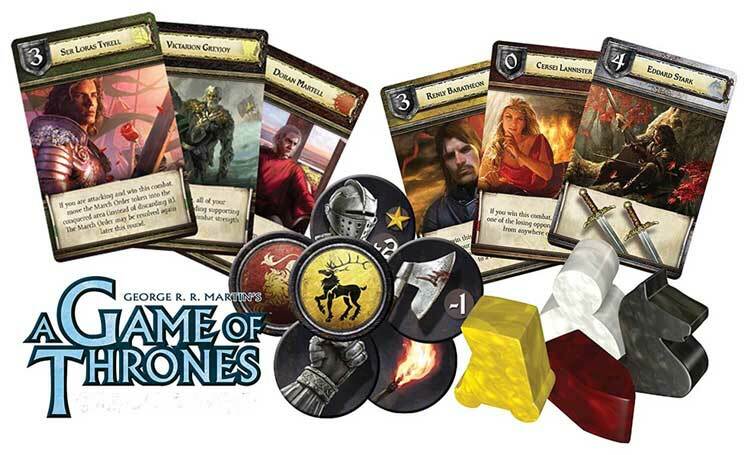 In short, while you cannot (yet) enjoy all the emotions that a game of chess provides, you can still get a ton of fun in a Game of Thrones themed environment playing the board game. Here’s hoping that someone will soon release a proper Game of Thrones themed chess set even if the chances are pretty slim. The manufacturer of this GOT board game has a 22-minute video tutorial which will take you through all the rules of the game. Check out the video below. Well one way to do it , is to build the chess set with 6 armies . A chess set with 6 armies? That’s intriguing. Would you like to share more details on how the whole thing works and where did you find one? I actually searched alot before writing this article and although I did come across a couple of home made GOT chess sets, they were not sale and people was just doing it as a fun project. I believe he meant you could have 6 armies to choose from, but you would only field two at a time…. unless you had one of those special 3-way or 4-way chess boards. That would be my choice as well if someone gave me the option to choose two armies from the GOT world! White Walkers vs the Nights Watch would solve the problem of who is what and THEN you can make each House have its own set… Starks, Targaryen, Baratheon, Lannister, Martells…etc. I’d buy them all.